Cowboy Boot Camp is unique. Our approach to teaching practical and thorough horsemanship is offered everyday because there are important issues that happen with a horse everyday! We want to expose you to the daily realities of equine ownership. We work within your schedule. Some people are here several times per week, while other are only available once a month or for a few days quartely. This allows you to learn at your own speed and means. But, the more you're here, the more you'll learn. Obviously, we know you can't be here everyday. So we conduct monthly demonstrations, workshops and events to help you better understand solid and responsible horsemanship. A trusting horse will take his rider's goals as his own and use his greater strength, willingness and endurance to help attain them. The better the horseman communicates those goals, the better the horse will strive to achieve those goals. One of the first opportunities a new "boot camper" can take advantage of, is to participate in the morning feeding. It is one of the most important horse management issues. We will teach you the nutritional values of the hay and supplements we use and how each affects the different ages and breeds of our horses. 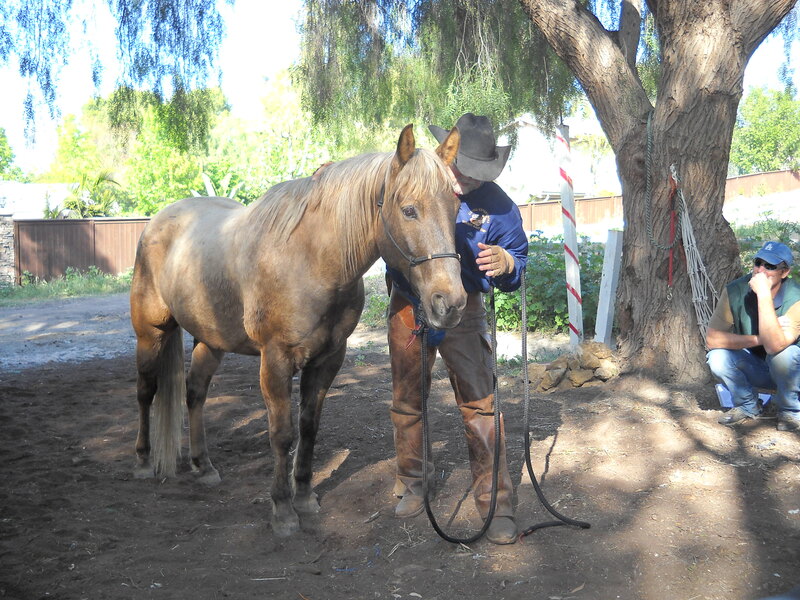 "No Feet, No Horse" Farrier Clinic or Cowboy Boot Camp's Science of "Hoofology"
For a horse, his feet and legs are his life. Therefore, it is important for a good horseman to pay special attention to these areas. 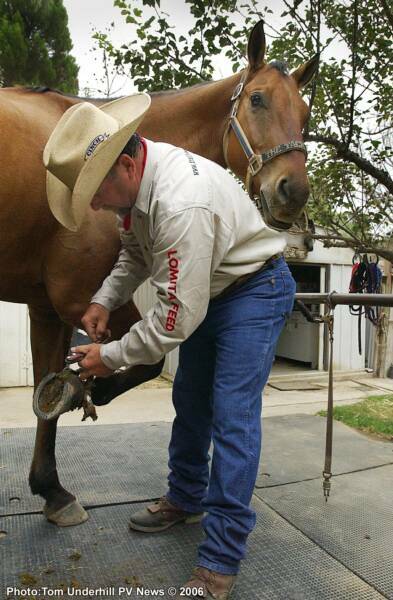 While this clinic will address basic horseshoeing, which includes the study of the horse's foot, natural hoof trimming & shoeing, a farrier must also deal with injured or deseased hooves as well as the application of special shoes. But, we will look at more than just these procedures. We will address what makes a sound horse, how to pull and replace a shoe on the trail, the effect of nutrition on the hoof, and what to look for when buying a horse. Nothing can be more true, than, "No Feet, No Horse." In nature, if a horse can't flee in the face of danger, he may not live long. So, we pay particular attention to their feet daily and teach you to handle and care for them safely from the very beginning. Once a horse learns to trust you working with his feet, he'll learn to trust you in other ways as well, which makes for a safer animal. Teaching you to handle this is more than an afternoon job, but once his confidence grows in you, he'll learn to trust you with his very life. "Hay! It's What's for Dinner!" We present various clinics with nutritional experts throughtout the year to offer indepth analysis of feeds, supplements and equine digestion depending upon the season. "Cool Nights Spur Winter Coats"
feel better or possibly even save his life. Despite their size and weight, horses are nature’s delicate creatures and if you’re a horse owner, or someone who’s planning for horse ownership, you should be prepared for an equine emergency. 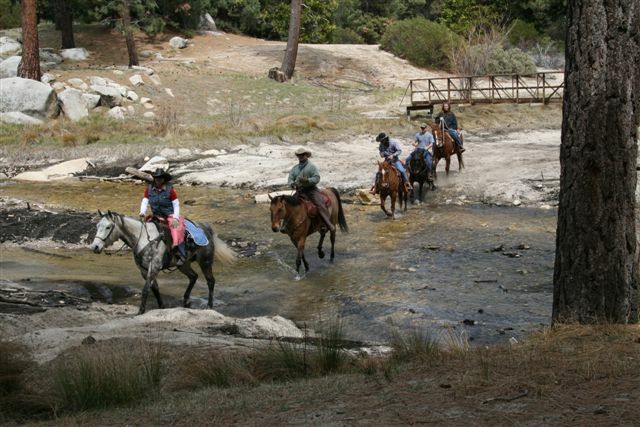 Unfortunately, bad things sometimes happen when you're on the trail or when you and your horse are at a remote location or at a time when a vet may not be available. As suggested in other chapters of the Cowboy Boot Camp Manual, it is very important to be familiar with your horse and know what is normal. Therefore, we stress being observant during grooming and tacking up to assure your horse’s health and well-being. Be aware of cuts, swelling and other signs that may indicate your equine partner is injured, ill or in distress. As a knowledgeable horseperson, you should know what constitutes an emergency. 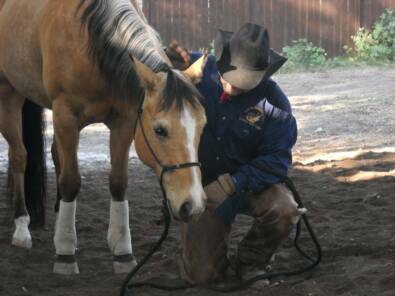 Emergency treatments & step-by-step procedure topics and more are covered and discussed at Cowboy Boot Camp horsemanship clinics. Conducted by equine veterinary practitioners, participants get an opportunity for “hands on” demonstrations on how to respond quickly and confidently to equine emergency situations. Needless to say, horse emergencies can be a challenging and emotionally charged situation for owners; however, with preparedness clinics such as these, problems can be reduced by educating owners about first aid procedures. How to respond if your horse colics or has other abdominal problems. How to care for a laceration, puncture wound and eye trauma. How to wrap a leg in case of emergency. What important data your vet needs to know prior to arrival. Do you know how to properly check vital signs and know what a horse's temperature, respiration & pulse should be? What are some distresses to lookout for. When and how to administer medication. What contents should every equine emergency kit include? Nothing can be more frustrating for a veterinarian than to receive an emergency call when actually it is a minor situation. How do you know what is an emergency and what isn't? It largely depends on each individual’s level of experience, but I suggest if you aren’t sure, call and provide them with the proper details then let them make the determination. Listed in the Cowboy Boot Camp Manual are some common conditions and illnesses which may be life-threatening and require immediate veterinary care. Preparation is vital when confronted with a medical emergency. In the years we’ve been teaching horsemanship and competing, we’ve tried just about everything and we know what a difference having the right equipment makes – it can dramatically improve your performance and communication with your horse. In our "Bit Understanding" clinic, we examine the various bits, their uses and their effect on your horse. We discuss the anatomy of the horse's head & mouth and the proper bit position and other tack. When riding your horse, you control him with your seat, legs and hands. Your hands control the bit and bridle, which is one communication tool used to gain control of your horse. Horses differ in their breed, training, use, age, and temperament. Not every bit is suited for every mount, and the bit you use now can change with different circumstances. The needs and training of horse and rider change over time. Our goal for a safe and pleasurable ride is to have a mount that is relaxed and willing to do what is asked of him. 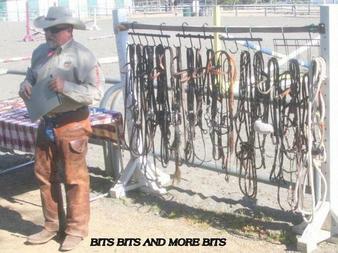 The type of bit and bridle is a very important tool in achieving this goal. 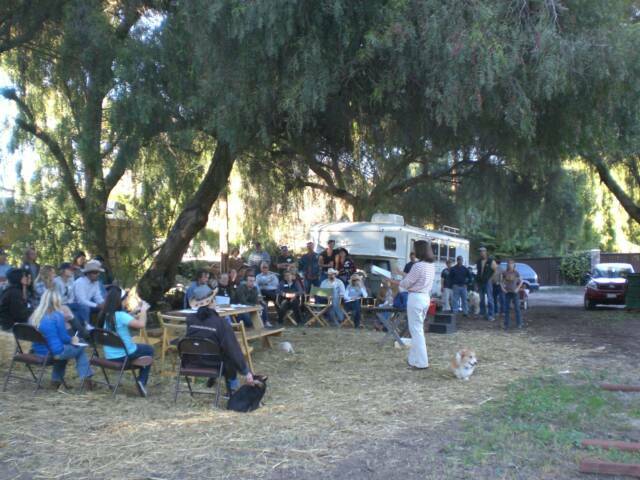 "The "Ground Work" clinic was a sterling addition to the teachings at Cowboy Boot Camp. Understanding the horse's need to have an assertive leader opens up the door to trust and respect - both ways. Jim did an excellent job demonstrating how horses instinctively read body language and demeanor. Just using your eyes, energy and stance sends a direct message. He and Lori explained how using the horse's balance of weight and power; using the point of hip and point of shoulder; combined with technique, you can move your horse without word or touch. Plus, you get him to respect you and your space and visa versa. Of course, they can explain all this infinitely better than I can review it. I'm sure all the other boot campers came away with useful equine communication skills. Just terrific. 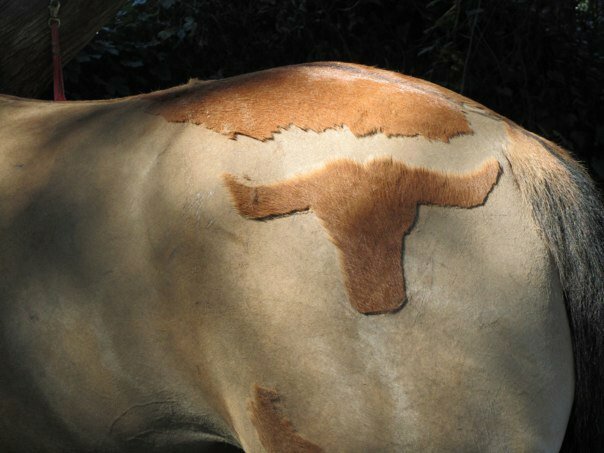 Thanks Jim, oh and Apache, Doobie, Bucky, and Dino." 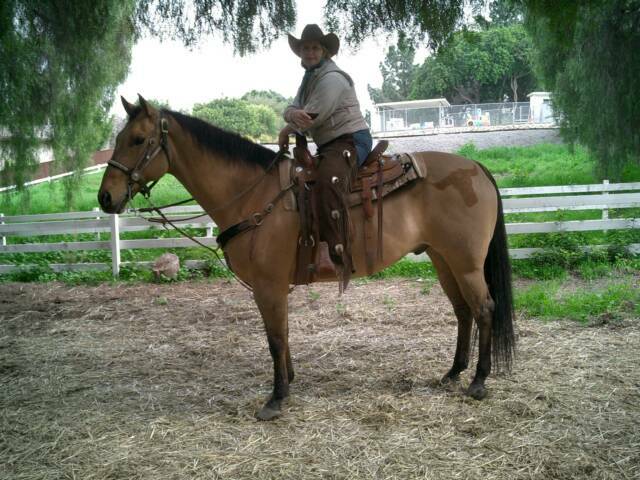 "Jim has such a way with horses and their advice and training is always excellent. Their style and experience brings results and they have something for everyone (even an english rider like myself). I've always found their clinics (bit clinic, emergency vet clinic, groundwork...etc) an excellent opportunity to expand my knowledge and would recommend them for any horse-owner or horse-owner-to-be. The Ground Work clinic was great. Jim's training worked in minutes with my horse Doobie. Very fast and effective training!! And today (the day after the clinic) he remembered everything that he was taught the day before. Looking forward to attending clinics in the future!" I bold the word “EFFECTIVE” because this is important. It doesn't matter the amount of “routine” ground work, but how effective is the ground work. It is not based upon time moving around in the round pen or how much at the end of a longe line. It is a step by step process that can take minutes or months for your horse to grasp what you’re asking of him. Ideally, you want to keep the ground work as minimal as possible, make it brief and effective, then mount up and move on. But, once the horse understands and makes that connection, you and your horse become a safer team.